Seeds for Bees Water Requirements - Project Apis m.
How much water to cover crops use? The 2016/2017 seasonal rains were early and ample. For now, it looks like California is out of a drought. However, water is still precious, and it is important to comment on the water requirements of the seed we are providing. We have developed seed mixes that have a low moisture requirement. Sowing seeds in the fall is a great way to take advantage of fall and early winter rains. If planted early to utilize the seasonal rains, robust, well-growing stands of the PAm Seed Mixes are possible without the use of irrigation. Early planting also ensures forage will be available for colonies come almond bloom. When conditions aren’t normal, like during the recent drought, irrigation may be necessary. The PAm Clover Mix will respond better to additional irrigation than the PAm Mustard Mix. We are working to provide more specific water requirements for each option. In the meantime, watch the precipitation you receive and monitor the growth of the seedlings to indicate if irrigation will be needed to supplement the year’s rainfall. There is evidence to suggest planting cover crops can actually increase water use efficiency and water availability. Cover crops add organic matter to the soil. Organic matter is excellent at holding water, it works like a sponge that traps and retains water. Organic matter holds 18-20 times its weight in water (USDA NRCS 2013). One can expect the PAm Seed Mixes to provide about 3.5 tons of organic matter per acre. Organic matter helps water stay where it’s needed most, around the root systems of crops. But cover crops also use water, so let’s take a closer look at how much water cover crops use in an orchard system. Cover crops grown in the fall and winter months will need less water due to shorter days and cooler temperatures. More research needs to be done to determine how much water cover crops use from October to March. Typically, this is the time of the year Seeds for Bees cover crops are growing. However, there is still something to be learned from a cover crop study that took place in an almond orchard from April to August. 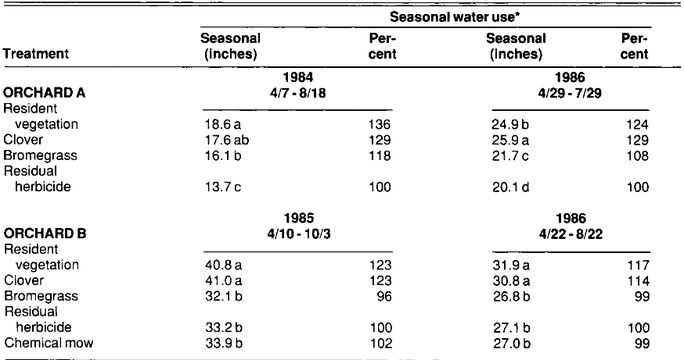 The results were published in California Agriculture in 1989 in an article titled, “Orchard water use and soil characteristics,” by Prichard, et al. The results are shown in Table 1 (below). Resident vegetation (weeds), clover, bromegrass, and herbicide (bare ground) were the four treatments that were compared in two orchards, a newly planted one (Orchard A) and a mature one with 70% soil shading (Orchard B). The herbicide (bare ground) treatment used the least amount of water. Bromegrass used from 4% less to 18% more water than bare ground. Clover used more than bromegrass, 14% to 29 %. The most water was used by weedy resident vegetation, from 17% to 36% more than bare ground. A clover cover crop used less water than resident weeds! If something is growing on the orchard floor, it might as well be a cover crop. It will use less water than the weeds.